I love experiencing a city through its food - researching in advance, asking locals where the best places are, or those happy accidents where you stumble upon a delicious place in a serendipitous way. I experienced a bit of all of the above last week while staying with my dear friend M. in Manhattan, and wanted to share the highlights with you. I tasted NYC's best cherry cheesecake; experienced country-style Chinese food; waited in line for free gourmet ice cream sandwiches; threw a dinner party with fresh produce from the local greenmarket and got converted to a Dough Brooklyn doughnut lover before ever having my first bite! Happy to have a partner in candid conversation and calorie consumption on my culinary journey through the city, M. and I started off on a high note with a stroll on the Upper East Side that took us to Two Little Red Hens Bakery. The bakery is a small brick-lined country kitchen with a big claim - it houses NYC's Best Cheesecake, according to an official panel of cheesecake experts. 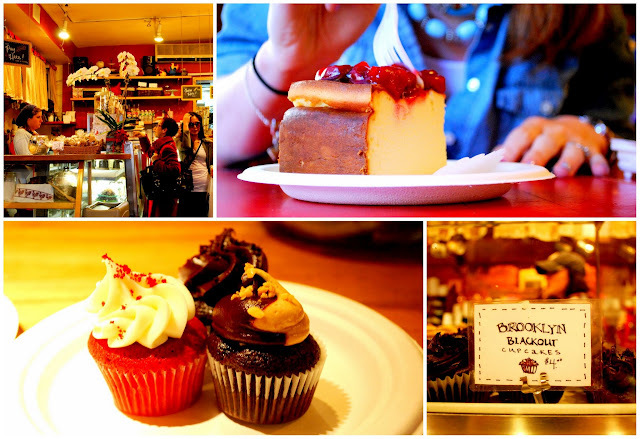 Being more of a cheesecake enthusiast who is working eating my way towards 'expert,' I've sampled from some other noted bakeries in NYC in the past and would have to agree - their cheesecake had me mentally booking my next trip after my first bite. I've honestly not experienced that kind of perfection in texture elsewhere. We also sampled a trio of mini cupcakes, each a burst of flavour from the dark Brooklyn Blackout Chocolate, to en-vogue Red Velvet, to staff favourite Peanut Butter Fudge. The staff are as sweet as the desserts - Nikki, Brooke, and Chelsey were so kind and welcoming and passionate about their baked goods. Their enthusiasm for the treats was contagious and made me to want to try every single item on offer. I'd like to go back and do just that - but the cheesecake is non-negotiable. 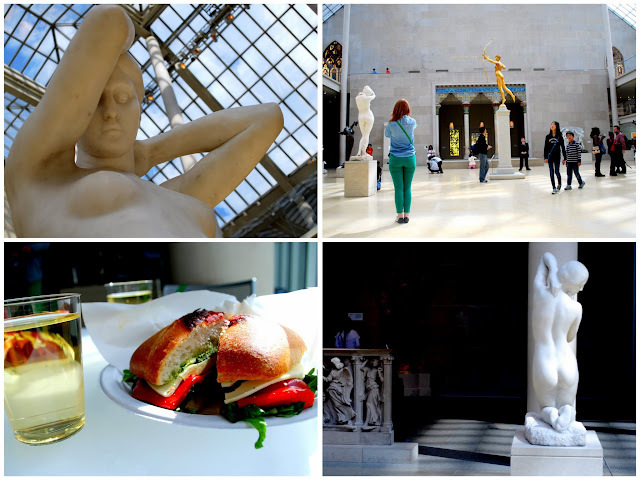 Looking for a late-afternoon snack in a beautiful setting, M. & I settled on the cafeteria in the atrium at the Met. We made our way through some of the exhibits (and the gift shop!) before settling ourselves to eat. One of my favourite things about M. is that we share the kind of friendship where it feels natural to wander about at our own pace before coming together to share intimately about what has moved us in our individual journeys - perfectly suiting a late-afternoon wander through a museum. I had never been to the Met before and was awed and moved by the beauty of the art and the space that supports and highlights it. The museum's cafeteria looks out onto some stunning statuary, the sunlight streaming from the glass ceiling above to play upon the curves and arches of the bodies. We feasted on a rather delicious roasted vegetable sandwich on fresh ciabatta and drank a glass of chardonnay that inspired a closer look at exactly what the statues weren't wearing. 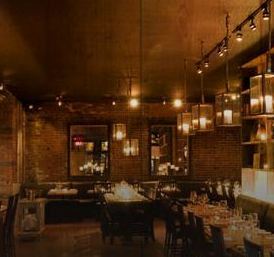 On Tuesday night, I got dressed up and treated myself to the full tasting menu and wine-pairing at Iron Chef Marc Forgione's restaurant 'Marc Forgione' in TriBeCa. The candlelight in the restaurant was very intimate and my taste buds documented the experience much more vividly than my camera could. This meal captivated my senses unlike any meal I've had to date: the smooth cream of the avocado mousse and hiramasa tartare; the sultry smoke of the bbq oyster; the crispness of the skin on the perfectly flaky halibut; the seductive muskiness of tortelloni with shaved truffle and Parmesan; the lip-tingling heat of the chili lobster broth; and the exquisite game flavour of house-made sausage. For dessert? Unbelievably indulgent Banana bread pudding with a bourbon caramel sauce. ....Unforgettable. As a belated birthday gift to M., I offered to make her a gourmet dinner with a theme of her choice. 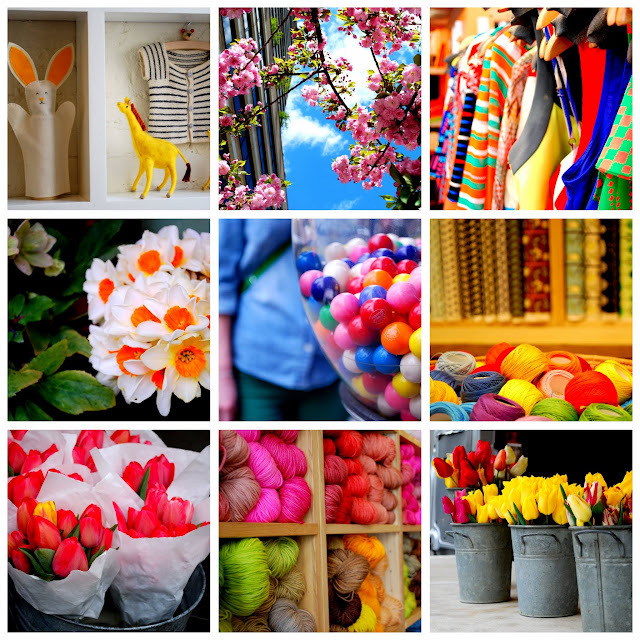 She chose 'colour' - which is abundant in NYC in the springtime, not to mention a current trend in fashion and decor. I happily clicked away with my camera to gather inspiration everywhere I turned. I made my way Wednesday morning to the Union Square Greenmarket where I was met with friendly faces eagerly selling their fresh produce and homemade treats. I snacked on some warm apple cider doughnuts while I perused the stalls for the ingredients for M.'s colourful birthday dinner. For the meal, I was inspired by a culinary tradition from the south of France called a 'Grand Aioli' that celebrates the harvest in a very garlicky and social way. 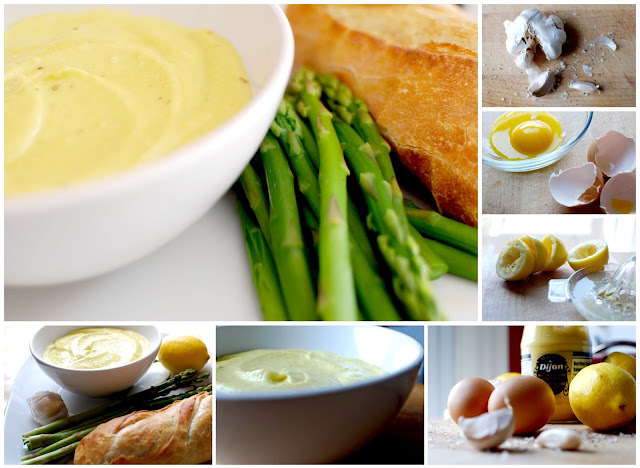 Essentially, everyone gathers around a table topped with a variety of meats and fish and fresh produce (cooked and raw), cut in bite-sized pieces to dip in creamy aioli (a blend of egg yolk, olive oil, dijon mustard and plenty of fresh garlic - you'll find the recipe at the end of this post). For the protein I roasted an organic chicken with lemon, and bought some plump shrimp. For the cooked vegetables, I roasted butternut squash and multi-coloured fingerling potatoes I bought from the market. I caramelized some Brussels sprouts and steamed some green beans and just-in-season asparagus. For the raw vegetables, there were red, yellow, and orange sweet peppers, baby carrots, and cherry tomatoes. The colour spectrum continued with roasted purple beets, marinated artichokes, kalamata olives and a baguette from Balthazar Bakery. It was a lovely meal - M. and her husband T. invited her friend C. to join the festivities and the four of us sat down and dipped to our hearts' content. The meats and vegetables were delicious on their own, but we used them as vehicles to carry as much as possible of the delectable aioli. The aioli came out a beautiful creamy yellow, which along with some gorgeous burnt-orange ranunculus and a fruit-studded water jug added even more of a colourful punch to the rainbow of vegetables on the table. Dessert was individual-sized pavlova (I wanted to make something with all the leftover egg whites), filled with homemade vanilla custard and topped with organic strawberries, blueberries and kiwi. I believe those Pavlova deserve a post of their own, so I'll get right on making some more. M. showed me this YouTube video about a bakery in Brooklyn called Dough. The opening shot of a large fresh doughnut dunked repeatedly into sticky glaze yielded an immediate: "When are we going?!" The video goes on to introduce pastry chef/owner Fany Gerson, who spent a long time getting her doughnut recipe just right - specifying the dough needs to be handled gently, "like a woman," and that "If you're happy, the donuts are happy." (A lesson I've found rings true in every project undertaken - culinary or otherwise). I have mixed feelings about doughnuts - I don't much like the ones at Tim Horton's (a Canadian road-trip staple) and usually opt for a cookie instead. 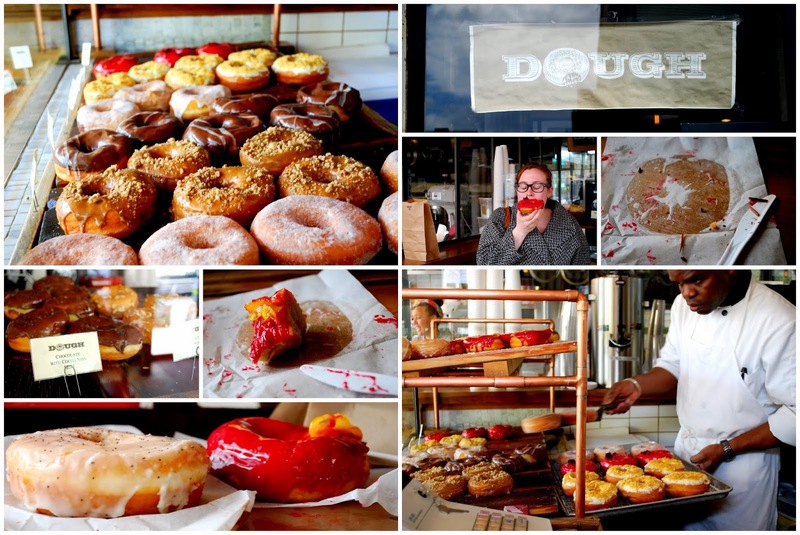 The feelings I had about these doughnuts at Dough were also mixed: a mix of ecstasy, euphoria, and pure bliss. At Dough, every doughnut has the same base (they use fresh grated nutmeg in the dough!) but the toppings change. There are adventurous flavours like Hibiscus Flower and Chocolate Chipotle, but I opted for a taste of the Blood Orange, Lemon Poppyseed, and Chocolate Cream. These doughnuts somehow manage to be light, soft, and large with the perfect amount of chew. The act of biting into one is so satisfying, you can't help but close your eyes to enjoy it. These donuts merit a moment of silence for how absolutely incredible they are. Seriously. A current NYC hotspot, Red Farm, was the choice for dinner on Thursday evening. This West Village restaurant is all a-twitter with buzz and made me hope it was worth it after three - yes, three - hours waiting for a table. It was! A unique combination of country rustic paired with authentic Chinese food with a modern twist, this place does farm-to-chopstick with panache. 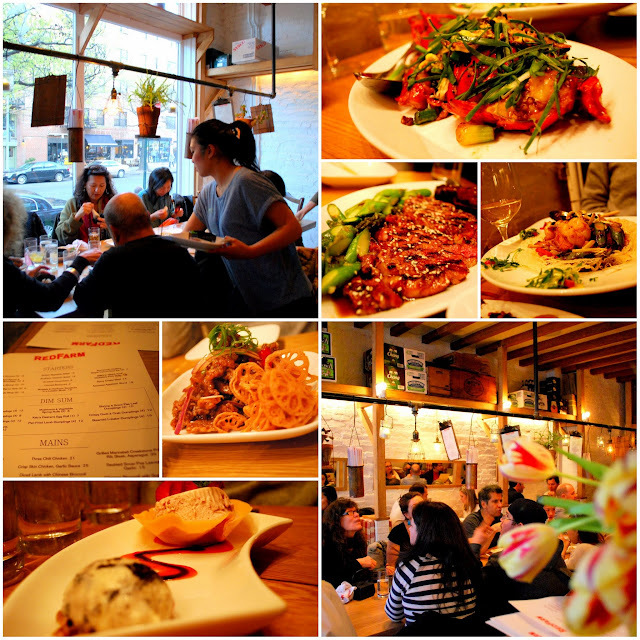 Owner Ed Schoenfeld runs the front of house like a master of ceremonies, seating celebrities, food enthusiasts, and eager eaters at the communal harvest tables. A focused nod from his smartly bespectacled visage gained us entrance (he told us he has ten pairs from a designer in Italy so he can coordinate with his outfits - this particular evening's were a beautiful bottle green). Eater NY tells me as many as 800 (!) people have been turned away of an evening, so I'm happy we got the nod. M., T., and I hungrily shared the family-style servings of crispy beef and lotus, lobster dim sum (elegantly served in mini martini glasses), prime rib and asparagus, the conch special, and the strawberry custard dessert. Unbelievably good. Friday's Twitter feed told me that 'wichcraft was giving away free ice cream sandwiches at their Bryant Park kiosk, so M. and I made the trek and waited in line 40 minutes for this sweet treat. These sandwiches were incredibly delicious, yielding an expression verging on disbelief at how good they were (see pictures below). They held strawberry ice cream between two perfectly crispy, crunchy cookie wafers, which tasted like a marriage between a peanut butter cookie and a graham cracker crust. Since it was my last full day in the city, I felt it merited some sort of culinary 'good-bye,' or rather a 'see you next time!' Suitably satisfied on the sweet end, we sourced out one of the many food trucks the city has to offer and tried an assortment of deliciously spicy Korean Tacos from the KimchiTacoTruck, which was parked next to a covered flatbed of old toys and antique circus paraphernalia! 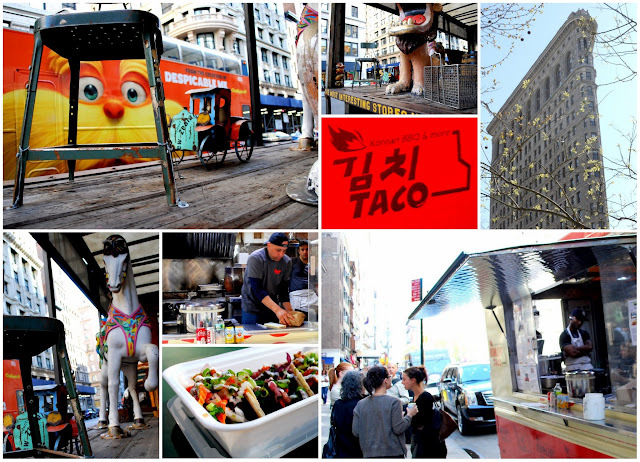 We tried the Grilled Korean BBQ Short Rib, the Spicy Seared Pork, the Pulled Chicken, and the Tofu Edamame Falafel and tamed the heat with a cold beer at one of the tables facing the Flatiron Building in sunny Madison Square Park. It was one of those moments where life is completely satisfying. I felt so grateful sitting there, eating tacos, enjoying the sun, talking about the week's adventures with M. and how I was sad to leave this vibrant, exciting, delicious city. I came back from my trip full - physically and inspirationally. I'm looking forward to settling back into my kitchen boudoir and seeing if I can caress my way to delicious doughnuts or whip up some Asian fusion. I'm also definitely looking forward to my next trip and the tastes it has in store. Since my return, I've been eating more vegetables to counterbalance the indulgence of my trip (that is, until I "accidentally" dipped my vegetables in more of my delicious homemade aioli). Using a blender or a food processor, puree garlic. Lightly whisk egg yolks until smooth and add to the garlic along with salt, pepper, lemon juice and Dijon mustard. Process to a smooth paste. While processor or blender is on, add oil in a continuous thin stream, blending until all the oil is incorporated and the mixture emulsifies and thickens, about one to two minutes. Store in a container covered with plastic wrap in the refrigerator until ready to serve with your choice of vegetables, meat, seafood, etc. Tastes amazing on sandwiches too! It is best eaten fresh, but will keep for one day (at most) in the fridge. What an amazing week! I definitely feel like you don't get the full experience the city's food culture unless you've tried the food from one of the food trucks, (I keep trying to track one down via twitter, but it's always in the different part of the city than I am when I'm there). My favorite on your list has always been the Union Square farmer's market, it's so easy to get inspired by all the fresh produce! Union Square is so inspiring :) It really was an incredible trip - I would love to live there at some point! And food trucks - I think they're wonderful and wish we had more of them in Toronto.